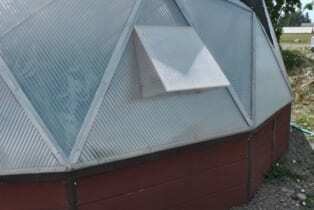 If you live in a very hot area of the country, you may find that the normal combination of cooling features may not be sufficient to cool your Growing Dome greenhouse kit in the summer. In this case, we recommend adding an extra solar powered cooling fan to any size Growing Dome as a part of our Desert Heat Package. If you live in a humid climate, this option may not be sufficient and you may want to consider a swamp cooler and/or air conditioner. Here is a company we recommend: Southwest Solar. The Solar Powered Cooling Upgrade replaces the 110v electric cooling fans on the 33′ and 42′ domes with solar powered 12v fans. This upgrade will reduce your carbon footprint by reducing electricity usage and will make you more self-sufficient. This is also a great option for people who do not have access to grid-tied electricity at the site of their Growing Dome. The 33′ Growing Dome kit comes with three 110V fans standard. 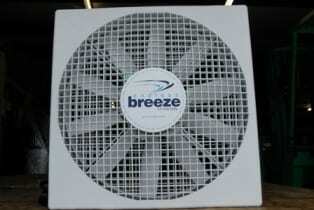 When you choose the solar powered cooling upgrade, you receive four 12v solar powered fans to replace the 110V fans. The 42′ Growing Dome kit comes with four 110v fans standard. When you choose the solar powered cooling upgrade for the 42′ Growing Dome, you receive five 12v solar powered fans to replace the 110V fans. When considering if this upgrade is right for you, take these additional points into consideration. The 110v cooling fans only use between 50-85 watts of energy each, which is the size of an average light bulb, and are on a theromstat. 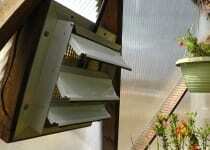 The solar powered fans may also be regulated by a thermostat, but they only run when the sun is out. The 12v fans bring in 1/3 of the amount of cooling air of the 110v fan (1000 cfm as apposed to 3000 cfm). That is why the upgrade contains one more solar powered fan than if you were to go with the 110v fans instead.